Do you dread meal prep? Whether you have been kid wrangling all day or working outside the home, dinner time can be hectic after a long day. I am ALWAYS looking for ways to make my mom life easier. So when I stumbled across the Once a Month Meals freezer cooking site while I was looking for meal prep sites for moms…I was hooked. The organizer in my fell in love with the efficiency and ease the site provides. The mom in my loved that I could have quick, easy and healthy meals on the table in minutes. Even after a long day at work. And the penny pincher in me loved that I could do all this for a fraction of the cost of meals from the freezer aisle at the grocery store. So how does it work? 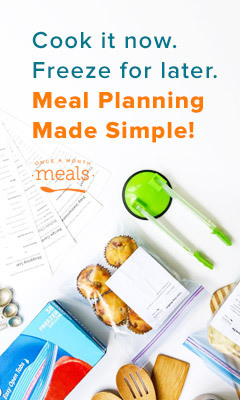 The crew at Once a Month Meals creates menus for you based on a variety of food wants and needs. Whole 30? Vegetarian? Allergens? They’ve got you covered. And then, here’s the genius part, each menu has not only the recipe cards but a grocery list, prep list, cooking day instructions (based on the most efficient order), labels with cooking day instructions AND an inventory list so you know what is in your freezer. They have menus ranging from 5 to 15 recipes. Some will take just a few hours to prep, some will take nearly a full day. But if you figure in the amount of time you will save when you don’t have to prep dinner every night, that time investment now is well worth it later. Check out this time lapsed video below where Once a Month Meals founder Tricia Callahan preps 20 Dump and Go Instant Pot or Crockpot meals in just 1 hour! On top of the pre-made menus, there is a catalog of nearly 8,000 breakfast, lunch and dinner options you can swap out to customize a menu for your family. Or just try some evening. Want to give freezer cooking a shot? Visit Once a Month Meals to check out the menu options. Scroll to the bottom to receive a FREE, 5 recipe mini-menu of your choice. Membership only opens a few times a year so grabbing your mini-menu and joining the email list is best way to know when the membership site is opening next.